Nevada often follows the lead of California when it comes to interpreting the law. But there are times when the law of the two states is irreconcilable. Take the case of Mr. and Mrs. Sotirakis for example. Mr. and Mrs. Sotirakis lived in California. They owned a home in California. They garaged and registered their cars there. The Sotirakis family bought their insurance from USAA. USAA issued the Sotirakis family its auto policy in California. As many Californians are prone to do, Mr. and Mrs. Sotirakis visited Nevada. While on their visit, the Sotirakis family was involved in an auto accident. Mr. Sotirakis was at fault. Mrs. Sotirakis suffered injuries. The USAA policy excluded liability coverage for injuries caused to a family member. California law allowed such an exclusion to be enforced. Nevada law states that the exclusion can have effect but will not eliminate coverage altogether. Instead, the amount of liability coverage may be decreased or stepped-down to the minimum limit required by Nevada law. This topic is discussed in AN EARLIER BLOG POST. In its decision, the Nevada Supreme Court ruled that the public policy behind Nevada’s insurance laws required such a result. Mrs. Sotirakis filed suit against Mr. Sotirakis in Nevada claiming that she was due compensation for her injuries from Mr. Sotirakis. USAA defended Mr. Sotirakis arguing that despite the fact that the accident happened in Nevada, California’s family exclusion effectively blocked Mrs. Sotirakis from recovering insurance proceeds from Mr. Sotirakis’ policy with USAA. USAA argued that California, not Nevada, had the more substantial relationship with insurance transaction and that California law should apply. 1. A financial responsibility or similar law specifying limits of liability for bodily injury or property damage higher than the limits shown in the Declarations, your policy will provide the higher specified limit. 2. A compulsory insurance or similar law requiring a nonresident to maintain insurance whenever the nonresident uses a vehicle in that state or province, your policy will provide at least the required minimum amounts and types of coverage. The case of Sotirakis v. USAA, 106 Nev. 123,787 P.2d 788 (1990) wound up before the Nevada Supreme Court. The court decided that the liability coverage exclusion was enforceable. e. the domicile, residence, nationality, place of incorporation and place of business of the parties. 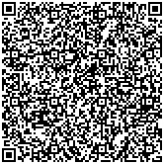 Dairyland, 701 P.2d at 808. The Nevada Law Blogs has previously discussed the concept of Choice of Law HERE. 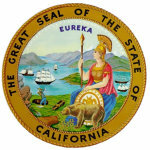 Applying the Choice of Law Concepts, the Nevada Supreme Court Court found that since the Sotirakis policy was issued in California to California residents who paid premiums in California and since Mr. Sotirakis was a California resident, California law should apply in interpreting the contract. In response to Mrs. Sotirakis’ arguments, the court found that the provisions of out of state insurance clause were inapplicable. EARLIER POSTS have made Nevada Law Blog readers familiar with Nevada’s Financial Responsibility and Compulsory Insurance laws. The Sotirakis Nevada Supreme Court clearly saw that the Compulsory Insurance provision was inapplicable. Nevada’s Compulsory Insurance law requires the owners of motor vehicles which are registered or should be registered in Nevada to maintain insurance on those vehicles. Since Mr. and Mrs. Sotirakis’ vehicle was registered in California and was supposed to be registered there, the Compulsory Insurance law in Nevada was inapplicable. The Financial Responsibility provision of the out-of-state coverage clause was equally inapplicable. Again, Nevada does have a Financial Responsibility law. However, that law triggers only if there is an accident and no immediate proof of insurance is available. In this case, there was insurance. The liability insurance was excluded under the policy’s provisions. Thus this is not a circumstance where USAA was obliged to provide “higher limits”. In conclusion, the Nevada Supreme Court found that the Financial Responsibility clause in the out-of-state coverage clause did not obligate USAA to cover Mrs. Sotirakis’ damages. The Sotirakis case gives great instruction on three important topics, conflicts of laws, Nevada’s Compulsory Insurance law and Nevada’s Financial Responsibility law. 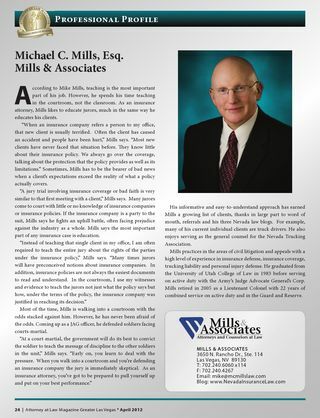 If you have questions on any of these subjects or other coverage issues, please contact Michael C. Mills at Mills & Associates for some answers.